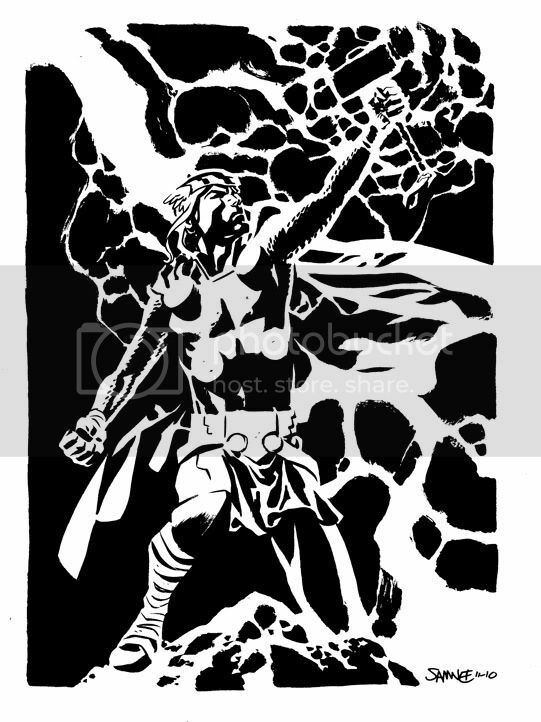 Chris Samnee: Saving Thor: TMA! Thank you all so much for the outpouring of support for Thor: TMA since Tuesday! It's been really overwhelming! For those of you that asked, the best way to show your support for the book, in the hopes that it will return, is to continue to buy it! Issue #6 is out next week. Issues #7 & #8 will be out in December and January. You can pre-order the first trade (out in December) and the second trade (out in March) on Amazon or at your local comic shop. There is also a great interview with Roger over at iFanboy along with preview art for #6, if you want to go take a look. Additionally, I'll mention that people are using #SaveThorTheMightyAvenger on Twitter and a Facebook page has been started. Excellent work as always. This is why I look at getting only certain floppies because of the quality of work bieng done I just can't wait for the trade(even thought I get that too). I was very nice and professional letting @Marvel know that the customers have spoken and since we are deciding the fate of DeadPool it is only fair that we decide the fate of Thor TMA(which we WANT to stay). Have they forgoten about that little moving picture will be coming out next summer? Great evocative artwork on display here, Chris! I'm glad to hear that there may still be a glimmer of hope out there with respect to TMA's future. It's time to mobilize the Merry Marvel Marching Society! I truly enjoy this series and I treasure the issues in my possession. I'll be pre-ordering the trade paperback via Amazon as Christmas gifts to send to several friends who don't usually visit comic shops but who I know will love reading this series! I won't give up hope for the future of Thor: The Mighty Avenger! Hi Chris, I'll continue to support TMA via Amazon buying trades because it's easier (I'm in Italy). MOre than a support is a pleasure as reader and artist that learn always a lot looking at your beautiful art and storytelling. Issue 6 was best comic I've read in months. no hyperbole.